Gartan finds a map to a treasure across the sea, and he decides he must have it. He plots and plans and refuses to be denied the greatest raid in history, even if he has to face down two of the greatest empires in the world. And then the dragon arrives. In this action-packed sword and sorcery novel of The Windhaven Chronicles, Watson Davis tells a tale of pride and greed, of magic beyond comprehension, and creatures beyond belief. 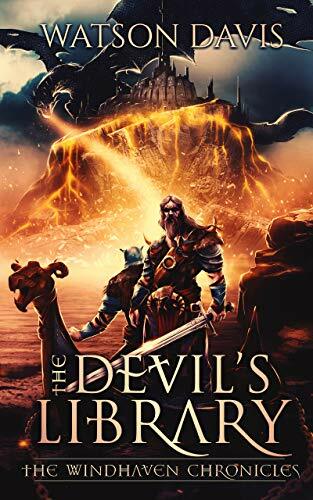 As most of you know by now, if you have followed my reviews on Amazon or reading my blog long enough, I am a huge fan of anything in the dark fantasy genre. So when I was approached by Watson Davis to review this ARC, I jumped at the chance and I wasn’t disappointed. Gartan, the Onei leader, reminded me of a 3-year-old. Very impulsive, selfish and prone to just doing what he wanted without thinking of the consequences. He drove me nuts for about half the book and I seriously wanted to smack him at times. Around the middle of the book, after the battle with the kraken, he started turning around for me. I believe it was when he kept Dyuh Mon from drowning after the kraken destroyed the boat he was on. On the other hand, Tethan, Gartan’s son, the exact opposite of him. He spoke Shiran, so was able to communicate with about almost everyone that they came into contact with….not that it did any good with Gartan just killing them. He was against Gartan’s quest (following a map on human skin to a great prize….sounds like a good time (sarcasm here). But like a good son, he followed his father into battle. Hell, he even killed a dragon, earning the respect of the clans and his father. I didn’t trust Dyuh Mon when he first appeared in the book. I don’t know if it was because you could tell that he was lying or his pointy teeth or what but he rubbed me the wrong way. For someone who used to be the Librarian for the Eternal Council, he was a weak little thing and he was more than happy to let Gartan do his dirty work for him. I did feel vindicated at the end of the book about my feelings for him (want to know what, read the book). There are so many secondary characters that this post would be taken over. When I say I got very upset when some of these characters died (like Nohel), I am not lying. Normally, the secondary characters are flat and two-dimensional. These are not and they add so much to the story. I will say that I liked the take on the magic users in this book. They were not all good, they used their magic in battle and they killed people with it. Which was utterly refreshing to read. Listen, I am all for magic being used for good with hearts and sparkles everywhere. But sometimes, you need to have magic that can blow a head off or explode a person. I did get a laugh out of the book. Sorry, but I was gigglesnort laughing at the description of a honking kraken. For some reason, I had the image of a very angry goose…..lol. I will also warn everyone, there is a lot of violence in this book. The Onei are barbarians and they definitely act like it. Between people getting blasted by magic, attacked by a mind-controlled dragon and getting killed in raids or by ships being attacked, the violence was through the roof and it was bloody. Now, it didn’t bother me any but it might bother someone who hates any type of violence. I will say that the Gartan/Dyuh Mon storyline, once it merged, did surprise me at the end. I was not expecting what happened to happen. I don’t want to give too much of that away but the chick that was freed…….she was creepy. The end of the book was pretty open and I really wasn’t surprised at by what I read. The way the book was set up at the end, though, would make a great intro to book 2. Why: I really enjoyed reading this book. The characters were well written and very 3 dimensional. I also liked the fact that magic wasn’t fluffy and cute in this book. It was used for good and bad. While the violence portrayed in the book didn’t bother me, it might bother other people who are sensitive to it.